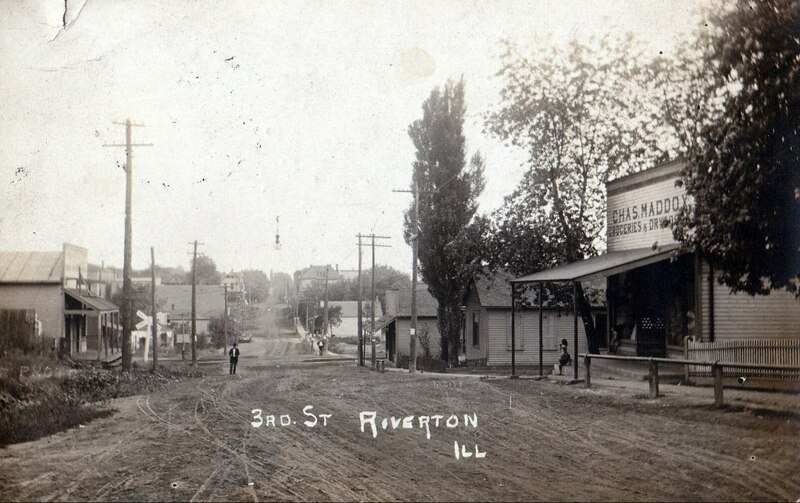 Like many early towns, the village of Riverton’s proximity to the Sangamon River contributed to its beginnings. A ferry across the Sangamon, operated by Ezikiel Judd, was the first enterprise in the area. He later transferred the ferry to his brother, Corbin. The brother operated it for just a year before turning it over to John Judy, giving the location its first formal name, Judy’s Ferry. In March of 1831, Abraham Lincoln, with his friends John Hanks and John Johnson, canoed down from Decatur for his first visit to Sangamon County. He walked to Springfield, and as they say, the rest is history. James and Abraham Dingman acquired the ferry in 1833 and operated it until the first bridge was built in 1837. James Dingman was a Revolutionary War veteran, and he and his brother are buried in Dingman’s Cemetery, also known as Ladysmith Cemetery, on the east side of Riverton. The land where Riverton sits was purchased in 1830 by Gershom Jayne, a Springfield physician and land speculator. He sold the property in 1837 to Samuel Danley, who owned it for a few months before reselling it to John Taylor, a Springfield merchant and speculator. Later that year, Taylor platted it under the name of Jamestown. Contributing to the town’s growth at the time the fact that it was on the proposed route of the Northern Cross Railroad. A group of four men, including James Frazier Reed (for whom Jamestown apparently was named) was awarded the contract to build the railroad from Jamestown to Springfield. Reed set up a sawmill in Jamestown to cut timber for the track. After construction, however, the Northern Cross Railroad proved to be unreliable and was closed. The railroad right-of-way later was used by the Sangamon & Morgan Railroad, the Great Western Railroad and finally today’s Norfolk Southern. John Tayor sold only a few lots in town during the early 1840s. After Taylor failed to pay taxes on his properties, nearly the entire town of Jamestown was sold at a tax sale to Joseph Loose of Maryland. Reed, meanwhile, had turned to manufacturing furniture and grinding corn at his mill. However, in 1846, Reed mortgaged his properties to the Sangamon County School Commissioner for $1,000, and he and his family joined the Donner Party for its trek to California. The party’s epic starvation ordeal became part of American history. Although most of the Reeds survived, Reed failed to pay back his loan, and his holdings near the future Riverton were foreclosed upon. The railroad was finally completed in the 1850s, spurring further growth in the area. John Keedy bought Jamestown from Loose in 1857 and built a distillery on the banks of the Sangamon on the west side of town. Again, however, success was elusive, and the town was sold to Parley L. Howlett in 1862. Finally, the town — renamed Howlett — prospered. An advertisement for lots in Howlett stated, “The land is high and rolling and skirted with fine belts of growing timber, and has many pleasant and romantic building sites, and which require but the touch of an artisan to render them beautiful and attractive”. Howlett enlarged the distillery and added a flour mill. He also is credited with opening one of the first coal mines in Sangamon County. Reportedly, Howlett actually hoped to strike oil, but a borehole turned up a six-foot-thick seam of coal instead. Thanks largely to the mining industry, Riverton was Sangamon County’s second-largest municipality (behind only Springfield) in the early 20th century. Even with his success, Parley Howlett was forced into bankruptcy in 1868. His holdings and most of the town were sold to Springfield financier Jacob Bunn. Bunn retained the distillery, mill and mine, but sold off many lots. The town was incorporated as the village of Riverton in 1873. The name change resulted from a state ban on naming villages after individuals. The Panic of 1873 was hard on Bunn, and he too was forced into bankruptcy. His holdings in Riverton were purchased by various individuals, effectively ending single ownership of the village. Riverton soon had two operating coal mines, and the town boomed with saloons, general stores, boarding houses and doctors. Local lore claims that Jesse James and his gang stopped overnight in Riverton on their way to their disastrous attempted bank robbery in Northfield, Minn. on Sept. 7, 1876. 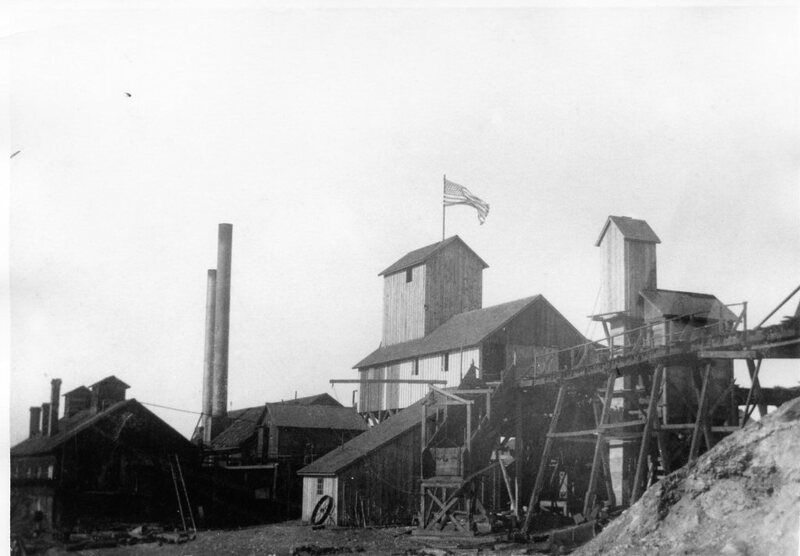 During the late 1800s and early 1900s, many Italian-American families came to Riverton to work in the mines and to take advantage of other business opportunities. That influx is reflected today in Riverton — one street in town is named “Piza Street,” for the Pescitelli, Ippolito, Zara and Antonacci families that lived on the street and originally paid for the street sign. Irish, German, English and Eastern Europeans also added to Riverton’s cosmopolitan mix. Mining was a dangerous, labor-intensive and tedious occupation. Saloons prospered, but sporting activities also provided relief from the everyday hardships of the residents. Newspaper articles of the time tell of baseball, basketball, shooting competitions and boxing matches held in town. 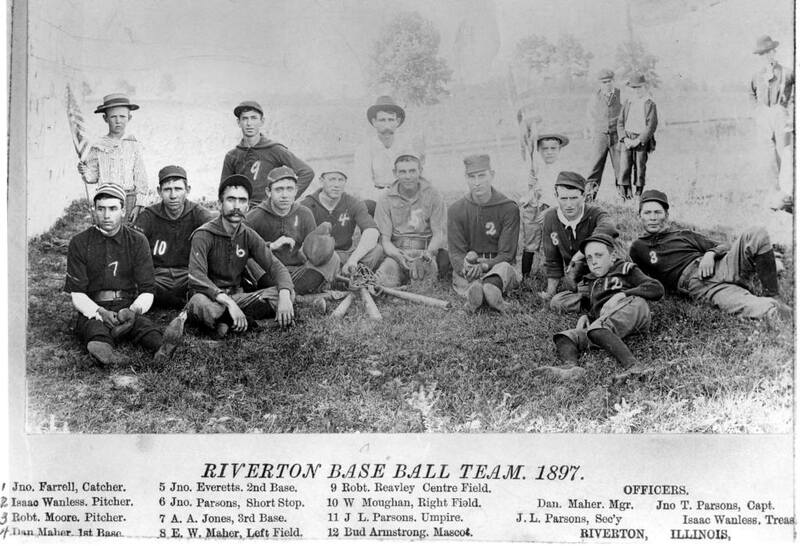 The Riverton Athletic Club has sponsored many of these activities since the late 1800s. Area residents could also attend live plays, first at the town’s own theater and later in the Village Hall downtown, originally a miners union hall. People could even roller-skate on the second floor of the building. 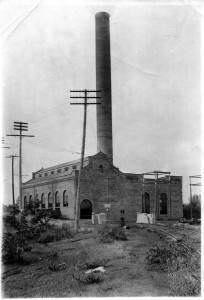 An electric generation station for the Illinois Traction System was built on the site of the distillery, providing power for both the village and the Interurban, an electric railway that connected Riverton with Springfield, Decatur and points beyond. As of 2014, Riverton remained one of the few municipalities in Illinois that owned and maintained its own utility systems. Electric power and natural gas are purchased at wholesale and distributed by the village. The village purchased water from Springfield until 1963, when Riverton built its own treatment plant. The village pumps its water from four wells near Clear Lake. Wastewater is treated at a lagoon facility east of town. The Riverton Volunteer Fire Department originally employed hand drawn carts. Its first motorized fire engine was purchased about 1918. Today the village’s fire protection needs are served by the Riverton Area Fire Protection District. Although little information is available on the early schools of Riverton, a new brick grade school was built in 1906, and a high school soon followed. Some of the smaller towns around Riverton, including Spaulding, Bissell and Oak Hill, had their own grade schools, but students came to Riverton for their high school education. (See Genealogy Trails for more information on some of the country schools in Clear Lake Township. Our thanks to commenter Mary Lou; see below.) Eventually, the schools consolidated to form Riverton District 14. The closing of the mines caused a dip in Riverton’s population, but with its small town appeal and close proximity to Springfield, it continues to be a thriving community. Today: Riverton, which is north of U.S. 36 seven miles east of Springfield, had a population in 2010 of 3,455, a 13 percent increase since 2000. NASCAR driver Justin Allgaier, a Spaulding native, attended Riverton schools. This entry was posted in Amusements, Coal mines and mining, Communities, Early residents, Lincoln, Abraham, Local government, Mills, Railroads, Sangamon River, Schools and school districts, Sports and recreation, Transportation and tagged Bunn family, Clear Lake, Donner Party, Gershom Jayne, James Frazier Reed, Justin Allgaier. Bookmark the permalink. Loved the article! Thank you for posting. Awesome article. Lots of history. Something to read and share about our village and how we came about. Thanks to Chuck Stone for this great article. Mr. Cribbett: Agreed. Chuck does great work. Need the pic of 7th st? The old bar built by Reisch brewery which still stands from 1904! Oldest bar in Sangamon county!! Crystal: Conrad’s, right? I haven’t been there; what can you tell me about it? Thank you for the article. I found it so interesting. My aunt owned the Riverton Hardware. My family lived with my grandmother who was of Lithuanian descent. I graduated from high school in 1956. I have fond memories of Riverton but the article brought it even more to light. Bob: I found a 1936 State Journal article that lists George Egizii as being on the honor roll at Riverton High. Some rural high schools at the time didn’t have all four years of high school, meaning their top students often enrolled at SHS to finish their high school education. That could have been the case with Mr. Egizii, but I found a 1928 story indicating Riverton had a senior class already then. As Chuck Stone’s entry on Riverton indicates, info on the local schools is lacking; sorry I can’t answer your question. Mary Lou: Thanks for the tip.